Hi guys. I'm not sure if this is the right section or even the right forum, but I think you might find this interesting. I made several concepts for Arleigh Burke Flight III, from 2023 to early 2040s. I have tried to not to go "too overkill" and incorporate already confirmed technologies. Hope you enjoy. The length was increased by 2 meters. Supposed to be last Arleigh Burkes to be ever made. 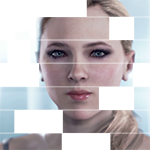 Last edited by NepsterCZ on October 16th, 2017, 6:31 pm, edited 10 times in total. Balistic defence/Arsenal ship? 256 VLS FTW! ships from the Flight IIA technology insertion batch onwards lack the second anchor and it's associated cut out and equipment. Hello, and thanks for your feedback. You are right, of course, and I have modified all appropriate files to reflect this change. Can I ask on the IIIB and IIIA what compensates for the loss of the two rear AN/SPG-62 fire-control radars? From what I understand, the AN/SPG-62 is used for terminal illumination, right? The AMDR, now officially named AN/SPY-6 should do basically the same, so I saw no reason to keep SPG-62 on ships that would enter service some 20 years in the future. So the answer would be that the loss of two rear AN/SPG-62 is compensated by the X-Band AN/SPY-6 located behind the two "gray" squares behind the Sea-RAM. But feel free to correct me, If I don't understand the technology correctly. I don't think there's much hope of hangaring V-22 either, at least not on the standard-hull versions. 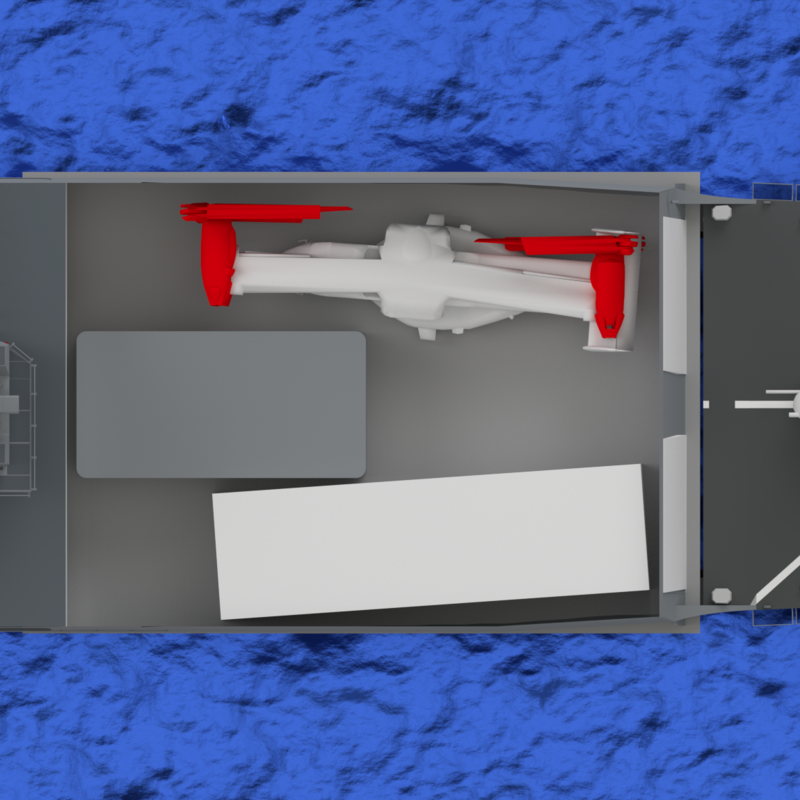 With a below-decks hangar, perhaps the interior arrangement could be shuffled enough to fit. Perhaps AGS-Light for the 155mm versions? Hi, thanks for your critique! 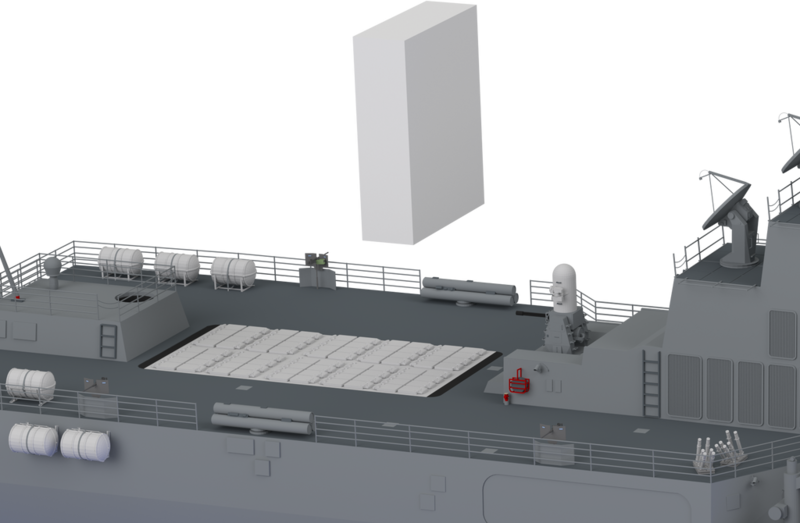 Considering, the last numerical update to the DDG51 class added entire hangar, I really don't think this would be much of an issue. Yes, you can argue I didn't take into account the hull thickness, nor any other numbers of systems that are included in the hangar. The key thing, in my opinion, is the fact that they do, indeed theoretically fit. So If you are building the ship, specifically with V-22 in mind, you should be able to fit them there. Although if you have any documents, related to this, I would very much like to read them. What are you doing to fit that additional VLS? The hangar was added to the DDG-51 design basically on deck, in space that was more or less empty before. The large impact on the ship was thus the weight and the topweight, which was compensated by the ships being slightly longer and about 800 tons (about 10% of the original weight) heavier. The basic rule, in ship design, is that you either make the ship bigger/heavier or you have to remove other stuff to fit new stuff. 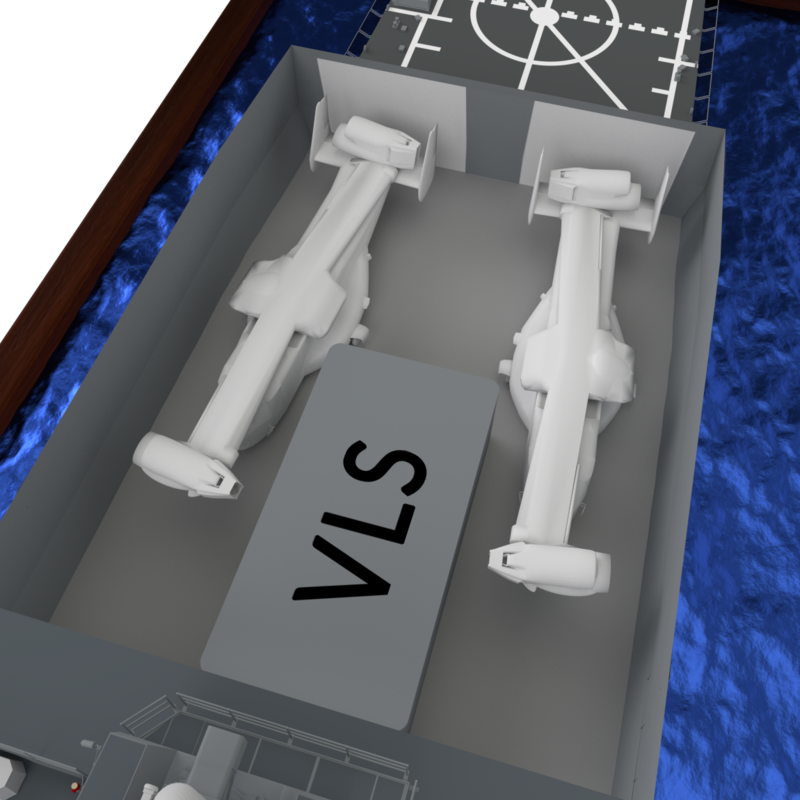 So, to add that additional VLS or to add an hangar large enough for V-22, you would have to lengthen the ship, make the ship heavier or loose something else on board. 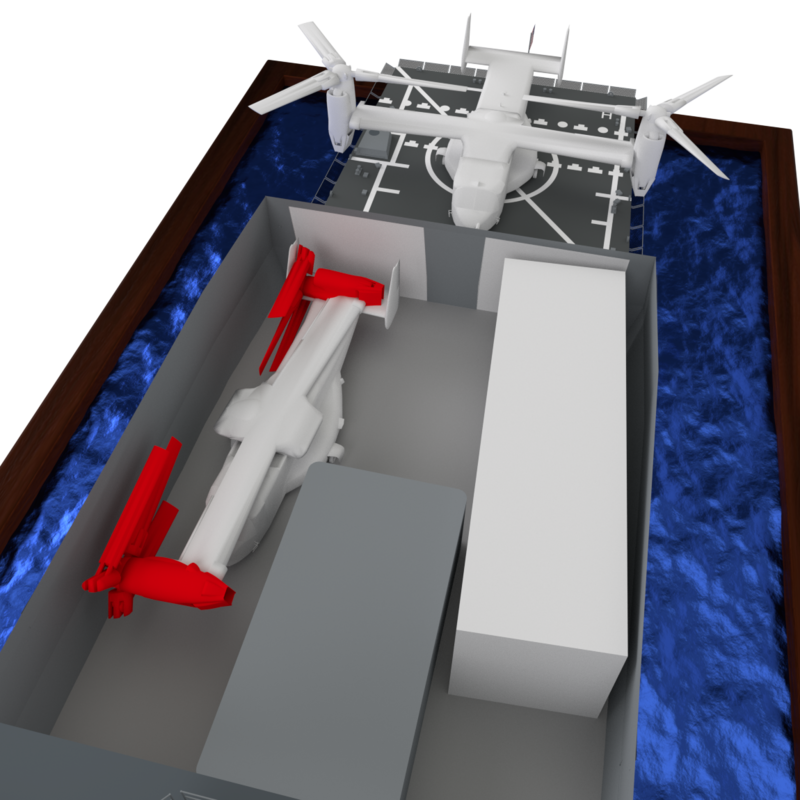 For that reason, I also doubt V-22 would fit on board, or if more VLS would fit. As for the V-22 fitting in the hangar. Your model of the V-22 has no propeller blades on it, which I think would make it no longer fit in there (try to draw a full box around them, I think you would clip the VLS space) but that aside.The VLS will have reinforcement around the actual launcher, to support it's weight and vibrations and lead that away to the main construction of the hull. The hangar is used not just for storing the aircraft, but also for a bit of maintenance, so you would have to be able to walk around the aircraft, including the top. The hangar goes so far forward in this plan, that it also means that you no longer have space for a magazine for the torpedo's, of which the tubes are placed on top of this hangar. Losing the aft VLS would make it not impossible for all this to be fixed, if the hangar was a bit higher as well. The hangars near the doors would also be quite cramped due to the prescence of the GTG air intake and uptakes over there. On first glance, http://www.sname.org/HigherLogic/System ... 115513afce this paper seems to look at an modification of the burke design which replaces the aft VLS with the ability to operate a single larger helicopter. That said, these are great models and quite interesting! To the first point, I never claimed that the ships are not heavier, I presume the tonnage would change drastically, I just honestly have no idea what could be the numbers. So for sure, these designs are heavier than standard Flight IIIA. To the V-22, I agree with you, the space is extremely limited when you carry two of them. You basically kill any free space in those hangars. I actually never even though that they would carry two. I just did the image for sake of illustration. Does even standard Flight IIA carry two Sea Hawks? About the propellers, we are getting into real details here, and I'm not sure my model or the V-22 is detailed, or accurate enough to simulate this, well, accurately. As far as I know, the V-22 propellers shift/fold so they are not the issue. I removed them because I'm lazy potato and I like to make my life easier. Just for you tho, I "ghettoed" them back in, please ignore the fact that the engine clips thru the model. Point is, they fit and the model kinda destroyed by now. Whatever. Those are the Osprey's dimensions, in the "folded configuration", and even then, it fits, as seen in these two images, barely, but it fits. "Due to increased automation in the future, these systems were miniaturized and whatnot blah blah blah"
But you're right. I don't even have the slightest idea where exactly are the torpedoes stored, where does the hangar end on "normal" burkes etc.. I think it would require a several-times more detailed model, to actually even make my point barely passable. Not gonna lie, this whole thing was basically "wouldn't it be cool to have V-22 on Burke, do they even fit?"